13-Feb-01 The A/C has arrived! I suppose for some people it's hard to get excited about air conditioning when the temperature outside is hovering below freezing, but not this guy! I'm always excited to see the big brown truck pull up to my door. The compressor is beautiful! I think it's even prettier than the chrome one I had on my last car. I upgraded to a polished compressor and an aluminum condenser to match the aluminum AFCO radiator we'll be using. Should be real cool - no pun intended. The condenser was a special order item and hasn't arrived yet. That's all right though, I'm not ready for it now anyway. 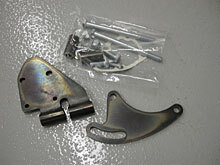 The first plan of action will be to powder coat the Alan Grove compressor bracket and mount the compressor. 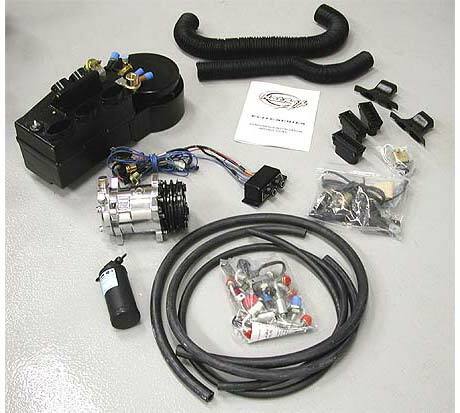 This kit locates the compressor on the lower passenger side of the engine. The alternator will mount on the lower driver side. This will keep the top of the engine looking clean and mean. Every time I drove my last car I would think of things I'd do different “next time”. You've probably done it too. When the fenders would rub turning into a driveway I'd think, “the next car won't have fenders” and when we had to cover the interior with towels to go for a ride I'd think, “the next car will have a BLACK interior”. One of the things I knew I'd never do again was make my own evaporator. Yes, I was stupid and went to all the work to make my own heat/air evaporator - just to save space and a little money - I thought. I'm sure it cost more to make it than to buy a good one and although it worked, I know this Hot Rod Air unit will run circles around it. Just for the fun of it, here are a couple old photos from 1994 of a bearded Scooter making the evaporator unit. 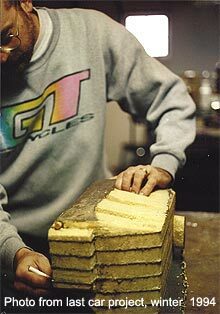 The first photo is of forming the mold. This is the kind of foam that won't melt on contact with fiberglass resin. Gee, I still have that shirt! 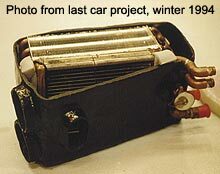 The finished unit is pictured here without the top and blower. It consisted of a Chrysler Cordoba heater core and a Winnebago “Mini-Wini” Motor Home a/c core sandwiched together at an angle in a homemade fiberglass box. I'm a lot smarter now. Life doesn't have to be so difficult. Call (877)302-8300 and tell them Scooter sent you - then keep an eye out for the big brown truck and thank me later.